Canadian soldiers of the Kandahar Provincial Reconstruction Team (PRT) on a patrol with the C7A2. The development of the C7 assault rifle paralleled that of the M16A2 by Colt. A Canadian Forces liaison officer worked with the United States Marine Corps in the M16A1 Product Improvement Program and relayed information to Canada's Rifle Replacement Program Office. The C7 is much like earlier M16A1E1s, rather than final product M16A2s. The earliest C7s were manufactured by Colt for Canadian Forces as the Colt Model 715. The C7 series of firearms is driven by the same direct impingement gas system as the M16 series. Like the M16A1 and M16A3, the C7 has both semi-automatic and fully automatic fire modes. The C7 also features the structural strengthening, improved handguards, and longer stock developed for the M16A2. Diemaco changed the trapdoor in the buttstock to make for easier access, and a 13 mm (0.5 in) spacer is available to adjust stock length. The most noticeable external difference between American M16A2s and Diemaco C7s is the retention of the A1 style rear sights. Not so apparent is Diemaco's use of hammer-forged barrels, introduced as the Canadians originally wished to use a heavy barrel profile instead of the M16A2 profile. Also, Diemaco has developed a different mounting system from Colt for the M203 grenade launcher for the C7 rifle family. The C7 has a cyclic rate of fire of around 700–900 rounds per minute (RPM). The C7A1 (Diemaco C7FT) replaces the iron sight/carrying handle used on the C7 with a modified Weaver rail for mounting optics. Canadian development of rails preceded U.S. standardization of the MIL-STD-1913 "Picatinny rail", so the "Canadian Rail" or "Diemaco Rail" differs slightly. There are 14 slots instead of 13, and each slot is narrower. The height of the rail is also higher, allowing the use of normal-height front sight post whereas a Picatinny rail requires the use of a higher F-marked front sight post. During development, the original rails were vacuum-bonded to the top of a bare receiver. For production, the rail and receiver were made out of a single forging. The mount can use traditional iron sights or the ELCAN C79 Optical Sight 3.4× power optical sight, both of which can be adjusted for individual eye relief. The optical sight was designed for the C9 light machine gun and includes horizontal and vertical mil-bars used for range determination and deflection, and a tritium glow-in-the-dark aiming post rather than the traditional crosshairs. The 3.4× is powerful enough to properly see targets at the maximum accurate range of 400 m (440 yd), though like most magnified optical sights it is prone to criticism for creating tunnel vision in close quarters situations. While the wide aperture helps to speed target acquisition, Canadian soldiers generally forgo the C79 sight in favour of non-magnified optical sights or backup iron sights when engaged or training in close quarters battle. The front sight was changed from the square post to a round post 1.3 mm (0.05 in) in diameter. 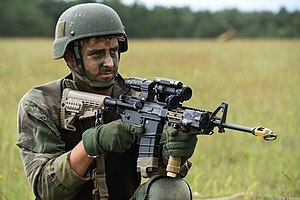 A Canadian soldier fires the current issue C7A2 assault rifle at the range with a C79A2 sight. This particular example is missing the standard TRIAD mount. With Canadian involvement in Afghanistan, Diemaco and the Canadian Forces developed improvements to the C7A1 to better suit the operational situations at hand. The result, the C7A2, has a four-point telescoping stock unit similar to that of the C8 carbine and a three-rail TRI-AD I mount on the front sight triangle. The selector lever, magazine release, and charging handle latch are ambidextrous. Also, the C7A2 is issued with green colour furniture as standard. These weapons are often seen with a similar plethora of accessories as their American counterparts given the overall commonalities of the system and the rail mounts. The C7A2 is also issued with the C79A2 ELCAN optical gunsight with 3.4× magnification but with a uniform green rubber armored coating, but some soldiers who are issued it have either been issued or have purchased sights like the EOTech holographic weapons sight and the Trijicon ACOG. Within an eight-man section, six soldiers will normally carry a C7A2: the section commander and second in command, two grenadiers and two riflemen, with only the machine gunners carrying a C9A2 LMG. The C7A2 is considered a "mid-life" upgrade for the C7 family. The addition of the TRI-AD rail mount has made it easier for soldiers to attach accessories such as laser designators and tac lights. Many A2's are also seen with folding grips from Cadex Inc. under the handguards which can store 2 CR123 batteries. The Canadian Forces is looking to upgrade and modernise their stockpile of C7A2 assault rifles, although nothing is yet official or certain as of mid-2016. One of the biggest upgrades that might be implemented is the replacement of the standard flat-top upper receiver with standard handguards, handguard end cap and front sight base with a monolithic upper receiver with integrated aluminium quad-rail handguard for increased modularity with accessories and free-floating the barrel for augmented precision. This would put the fleet of service rifles of the Canadian Armed Forces on par with Colt Canada's latest offerings and upgrades of the Danish and Dutch militaries who have adopted rifles with monolithic upper receivers. This version will require the use of the Colt Canada M203A1 with a different mounting system due to the new aluminium quad-rail handguard. Since Colt Canada developed and released the MRR (Modular Rail Rifle) that uses a monolithic upper receiver with the Magpul M-LOK attachment system, the Canadian Armed Forces might be heading in that direction instead, along with a shorter, 18.6-inch (470 mm) barrel, instead of the standard 20-inch (510 mm) barrel, and straight gas tube with a low-profile gas block The possibility of using integrated suppressors is also something that is being looked into. A shorter charging-handle latch will also be used as opposed to the very long C7A2 latch, which gets caught on equipment and vests, which causes the latch to bend and break the charging-handle. The Colt Canada C8 carbine range are carbine variants of the C7 family, and are mechanically and aesthetically very similar to the Colt 653. Colt made the initial C8s for Canadian Forces as the Colt Model 725. The C8 has a 368 mm (14.5 in) A1 profile barrel like the Colt Model 653 M16A1 carbine, but with a 1 in 180 mm (7 in) rifling twist appropriate for the 5.56×45mm NATO C77 cartridge. The C8 incorporates the design improvements featured on C7 assault rifles. The C8 has a cyclic rate of fire of around 750–950 rounds per minute (RPM). The improved C8A1 (Diemaco C8FT) is essentially a C8 carbine with a C7A1 flat-top upper receiver; the carbine having a 36.8-centimetre (14.5 in) barrel versus the 50.8-centimetre (20.0 in) barrel typically seen on the C7. The overall layout of the weapon remains essentially unchanged except for the upper receiver and the general inclusion of the C79 sight. C8A1s have also been more commonly seen with the detachable carry handle with A1 sights developed by Diemaco for both the C7FT and the C8FT. The C8A1 was never officially adopted by the Canadian Forces and was only used in Afghanistan for the ability to use the C79 optical sights. The C8A2 carbine is very similar to the C8, but having a cold-hammer forged heavy 14.5-inch (370 mm) barrel (as opposed to the 14.5-inch pencil-profile barrel) and a flat-top upper receiver. The Special Forces Weapon (SFW) features a longer, 400 mm (15.7 in) barrel of a heavier profile than the C8A1. It is designed to provide a fire support capability in carbine form. A sleeve, called the simon sleeve, is slipped over the end of the barrel and is retained by the compensator and its crush washer. It is used to mount bayonets and M203A1s. The front sight base is strengthened for mounting of the Heckler & Koch AG-C/EGLM grenade launcher. The British military acquired a number of SFWs, primarily for their special forces, under the designation "L119A1" but has since been upgraded to "L119A2" specifications. This version of the C8 is also in service with the Norwegian Special Operations Command. Concerns that Princess Patricia's Canadian Light Infantry had with the C8 led to the creation of the C8FTHB. The C8FTHB (Flat Top Heavy Barrel) features numerous improvements over the C8, including a heavy profile cold hammer-forged M4 profile barrel featuring a grenade launcher cut out for mounting of the Canadian Forces M203A1 and bayonet and Elcan C79 Optical Sight. Some of the earlier C8FTHB carbines used old refurbished C8 receivers. "FTHB" was stamped next to the C8 markings on the lower receivers. Colt Canada later manufactured new lower receivers with C8FTHB markings. Later, C8FTHB carbines that were upgraded to the C8A3 had "A3" stamped next to the markings, giving "C8FTHBA3" markings. Only 400 C8FTHBs were upgraded to C8FTHBA3s before Colt Canada started simply marking new receivers "C8A3". The C8FTHB was quickly replaced by the C8A3, which features the same cold-hammer forged barrel and flat-top upper receiver as the C8FTHB as well as all the mid-life upgrades that appeared on the C7A2 such as the green furniture, ambidextrous charging-handle latch, magazine release and selector lever. It also includes the TRIAD I rail for C8, which has one slot less than the C7 TRIAD I, to accommodate the M203A1 sight. Two additional C8 variants exist. The C8CQB is similar to the Mark 18 Mod 0 CQBR, having a 250 mm (10 in) or 290 mm (11.6 in) barrel and a Vortex Flash Hider made by Smith Enterprise Inc. The smaller Personal Defense Weapon (PDW) variant has an overall length of 530 mm (20.7 in) with stock fully retracted. It has a 140 mm (5.7 in) barrel and the receiver extension has been shortened by 42 mm (1.65 in). In 2010, the C8 IUR (Integrated Upper Receiver) was adopted by all four branches of the Danish military, and the Danish Security and Intelligence Service's SWAT teams, as the "Gevær M/10". In 2011, the Royal Canadian Mounted Police adopted a semi-automatic only version of the C8 IUR with ancillary components as their patrol carbine. Colt and Diemaco also paired up to develop a squad automatic weapon variant of the series. The Diemaco Light Support Weapon (LSW) features a heavy barrel suitable for sustained fire. The LSW can only fire automatically. The LSW has a boxy square handguard with a carrying handle and a vertical foregrip that can be used as a monopod. The LSW was made with no bayonet lug until recently[when?] because of the original bipod. A new bipod attaches to the same barrel yoke as the carrying handle and front grip, so current LSWs are made with a bayonet lug. Unlike many M16 variants, it fires from an open bolt, allowing the removal of the forward assist. The LSW is used by the Royal Danish Army and the Netherlands Marine Corps (LOAW / LOAWNLD) fires from a closed bolt and also has a semi-automatic firing mode. The Diemaco LSW was originally a license produced variant of the Colt 750, but both Colt and Diemaco have upgraded their respective weapons to include features like a detachable carry handle and other features separately. Diemaco's C7/C8 family is completed with two designated marksman variants, the C7CT and C8CT, with CT meaning Custom Tactical. These accurized C7/C8 variants are designed to provide accurate engagement up to 600 m (660 yd), while providing system commonality to other fielded weapons. They have two-stage match triggers and weighted stocks to counterbalance the heavy 508 mm (20.0 in) or 410 mm (16 in) free-floating barrel surrounded by a tubular forestock. A removable bipod, rails for designators, sling, etc. attach to that forestock. A special, distinctive pistol grip is fitted and the C7-style buttstock can be adjusted with shims. Sound suppressors are usually fitted. The rifle is designed as a sniper spotter weapon or a police containment weapon. The CT series weapons meet or exceed all applicable military standards including: reliability in all environmental and operational conditions, accuracy, lethality, maintainability in field conditions and safety. Direct gas system: The unique direct gas system eliminates the operating rod and keeps all of the firing forces in line with the bore for maximum accuracy and reliability. Hammer forged heavy match barrel: The very heavy barrel profile maintains zero with accessories fitted and provides extra thermal mass to dissipate heat for enhanced consistency. Flat top: The upper receiver can be manufactured in the original Canadian Forces specification Weaver rail, or with a MIL-STD-1913 Picatinny rail. Diemaco makes a training version of the C7 named the C10. It fires .22 Long Rifle ammunition, but is only capable of semi-automatic fire. The stock and lower receiver are one piece. The C 10 was proposed but never implemented, and no .22 caliber sub-cal system was/is used in the CAF after the withdrawal of the C1A1 rifle. The Army Cadet Corps had moved away from .22 caliber rifles to .177 pellet rifles some years ago. In 2008 or 2009, Colt Canada introduced a completely new designed upper receiver with integrated rail attachment system. The front handguard is in this system permanently attached to the upper receiver. The whole system is forged from one piece, and is sometimes called a monolithic rail. This system allows for a completely free floating barrel. Another unique feature is that the system can be adapted for different barrel lengths by screwing on an extension. The system was introduced as an upgrade in the Dutch army with the C7 and C8 in 2009 and currently is introduced with the Danish Army. Colt Canada introduced the MRR, or Modular Rail Rifle, in 2015 and released it for sale to the market in 2016. It is essentially a monolithic upper receiver with Magpul's M-Lok attachment system for accessories. The rifles are offered with 11.6", 14.5", 15.7" and 18.6" barrels. The 11.6" version features a shorter handguard. As of late 2016, the 14.5" variant is only offered to LE and the military. 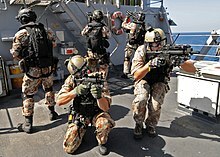 C8 CQB (Close Quarters Battle) as used by a boarding team of the Royal Danish Navy. Denmark bought the first batch of C7A1 in 1995 and C8A1 in 1996, designating them the M/95 and M/96 carbine. In 2004 the LSW, named LSV M/04 was added to the arsenal. These are to replace the German made M/75 (H&K G3), which has been the main infantry weapon since 1975. The C7A1 is issued to standard infantry units of the Royal Danish Army. The C8A1 is issued to units where the physically longer C7A1 can be obstructive to that units primary work, such as logisticians, tankers and special units. Jægerkorpset and Frømandskorpset (Special forces) use the C8SFW with a 401 mm (15.8 in) barrel and extra front rails. The now defunct Patruljedelingen, a draftee LRRP-unit, also used the C8SFW. The LSW used to be issued to "support gunners" in infantry squads. However, it is planned[when?] that the Royal Danish Army will only use 7.62mm belt-fed machine guns for the support role. Most of the LSWs are intended to be transferred to the Danish Home Guard. The Army almost exclusively use the C7A1 and C8A1 with the Elcan C79 optical sight, while the Danish Home Guard use the C8A2 with the Swedish produced Aimpoint. The main feature of the Aimpoint is the "both eyes open" sighting. This is the preferred sighting method at shorter ranges. The C7A1 was first issued to field units of Logcoy/Danbn/Dancon of the Danish International Brigade, in October–November 1995 shortly before the transition from UNPROFOR to IFOR in Bosnia. On 4 January 2009 the Danish army lost a number of small arms including M/95 and M/96 rifles to armed robbers who overpowered the guards at Antvorskov Kaserne. The police recovered the last of the stolen weapons on 22 November 2011. In 2010 the Danish Defence Materiel Service ordered an improved version of the M/96 and M/95 from Colt Canada under the Danish designation M/10, which Colt Canada designated the C8 IUR. It features a 401 mm (15.8 in) floating barrel, fully ambidextrous controls, flip up iron sights, a collapsible buttstock with more positions, and the Integrated Upper Receiver (IUR). During the 2015 Copenhagen shootings one victim was killed with an M/95 issued to the Danish Home Guard that was stolen in a home invasion robbery. In 2007 and 2008, Canada donated 2,500 surplus C7 assault rifles to the Afghan National Army. In 2011, the ANA gave back the C7s since the Afghan security forces chose the American M16 instead. Canadian Forces officials said the Canadian rifles would be shipped to Canada for disposal. Latest upgraded C7NLD variant of the C7 assault rifles in Dutch service, 2013 (seen here with yellow blank-firing adapters). The most commonly used version in the Dutch Military is the C7. The 11 Luchtmobiele Brigade [nl] (Airmobile Brigade), consisting of 11 Infantry Battalion Garderegiment Grenadiers en Jagers, 12 Infantry Battalion Regiment Van Heutsz and 13 Infantry Battalion Regiment Stoottroepen Prins Bernhard uses the C7A1, and the C8A1 (Diemaco C8FT) was mainly used by the Korps Commandotroepen later replaced with the HK416, the paratroopers of the Luchtmobiele Brigade (one company per battalion), the Korps Mariniers and most of the recon units of the various combat units, including the Forward Air Controllers and the reconnaissance units of the cavalry and the artillery. The Korps Mariniers also uses the LSW, which is locally known as LOAW. Many of the Dutch C7s, C8s and LOAW have had an overhaul: the rifle's black furniture has now been replaced by dark earth furniture. New parts include a new retracting stock, the Diemaco IUR with RIS rails for mounting flashlights and laser systems, and a vertical foregrip with built-in bipod; the thermold plastic magazines have now become brown in color. The ELCAN sighting system has also disappeared in favour of the Swedish made Aimpoint CompM4 red dot sight. These upgraded versions are now known as C7NLD, C8NLD, and LOAWNLD. The Diemaco C8 SFW (Special Forces Weapon) is used by the SOG and has been seen with Aimpoint sights and various attachments. Members of 43 Commando Fleet Protection Group Royal Marines train using L119A1 carbines fitted with a CQB upper receiver. The UK first selected the Diemaco C8 in the mid 1990s as the Special Forces Individual Weapon. This selection was later reconfirmed in the mid 2000s, by which time Diemaco had become Colt Canada. The weapon is so well-liked, reliable and successful that the planned competition to seek a replacement of the C8 from 2014 has been deferred in favour of continuing with the C8. Use of the C8 has expanded to include, among others, the original SAS and SBS, the Special Forces Support Group, the Pathfinder Platoon of 16 Air Assault Brigade, 43 Commando Fleet Protection Group, Royal Military Police Close Protection teams and MoD Police. There are about 2,500 in service. A number of barrel lengths are available for different users and most weapons are now fitted with Knights Armaments Rail Adapter System handguards and Picatinny rail flat-top upper receivers. Most users fit Trijicon ACOG x4 sights with CQB reflex attachment, but other sights are used. Various laser, light, downgrip and other attachments are used. Surefire vortex-type flash hiders are generally fitted, and suppressors are available. The standard Canadian bayonet is issued, but rarely used. Coloured furniture is becoming commonplace. The UK very much prefers polymer magazines to metal on grounds of weight and reliability and has now standardised on these for all C8 and operational SA80 users, with well over a million magazines purchased. Many weapons are fitted with the L17A1 underslung 40mm grenade launcher (UGL), the UK designation for the Heckler & Koch AG-C. Detachable shoulder stocks are available for stand-alone use of the UGL. A recent report stated that 43 Commando Fleet Protection Group would be fully armed with C8s, due to their reduced ricochet, limited collateral damage" features. Afghanistan: Donated weapons were previously used by the Afghan National Army, but the weapons were later returned to Canada. Canada: Used by the Canadian Forces and law enforcement agencies including the Royal Canadian Mounted Police, Dryden Police, Halton ERT, the Ontario Provincial Police, York Regional Police and Emergency Task Force (TPS). It is also used by the Correctional Service of Canada. Netherlands: Used by the Military of the Netherlands. Norway: Used by the Norwegian Police Security Service, Forsvarets Spesialkommando (Norwegian Army) and Marinejegerkommandoen (Royal Norwegian Navy). United Kingdom: Used by the Royal Military Police, the Pathfinder Platoon of the Parachute Regiment and the United Kingdom Special Forces. ^ a b A derivative of a United States design. ^ "WorldGuns – C7/C8 Rifle". Retrieved 15 November 2014. ^ Fowler, Will (10 Apr 2010). Certain Death in Sierra Leone: The SAS and Operation Barras 2000. Raid 10. Osprey Publishing. pp. 24–25. ISBN 9781846038501. ^ "Canadian American Strategic Review - Canadian Forces Automatic Rifles". May 2010. Archived from the original on 2011-07-06. ^ "C8A2 Technical Specifications" (PDF). April 2009. Archived from the original (PDF) on 2012-04-25. ^ "Colt Canada Corporation". 212. Archived from the original on 22 September 2013. Retrieved 6 June 2013. ^ Chris Purdy. "Front-line RCMP officers to get high-powered guns". The Globe and Mail. Retrieved 2013-08-31. ^ "RCMP Adopts C8 Carbine". Soldier Systems. 2011-10-23. Retrieved 2013-08-31. ^ "Custom Tactical". 2011. Archived from the original on 2011-10-26. ^ "Brochure Colt Canada 2010" (PDF). 2010. Archived from the original (PDF) on 2012-10-30. ^ "Algemene Vereniging van Reserve Militairen" (in Dutch). Archived from the original on March 25, 2014. Retrieved January 31, 2013. ^ "Fakta om våbenrøveriet mod Antvorskov Kaserne" [The facts of the weapons robbery at Antvorskov Kaserne] (in Danish). Police of Denmark. 25 March 2009. Archived from the original on 17 February 2015. Retrieved 28 April 2015. ^ "Politi finder 40 våben fra kasernekup" [Police recover 40 weapons from barracks coup] (in Danish). Danmarks Radio. Ritzau. 23 November 2011. Retrieved 18 February 2015. ^ "Denmark M/10 Carbine". 02a574b.netsolhost.com. 2010-04-26. Retrieved 2013-08-31. ^ "Terrorangreb i København: Gerningsvåben stammer fra et hjemmerøveri" [Terrorist attack in Copenhagen: Perpetrator's weapon came from a home invasion robbery] (in Danish). Danmarks Radio. 18 February 2015. Retrieved 18 February 2015. ^ a b "Canadian military donates 2,500 rifles to Afghan army". CBC.ca. December 23, 2007. Retrieved June 15, 2011. ^ a b Brewster, Murray (16 June 2011). "Afghan army gives donated rifles back to Canada in favour of U.S. weapons". The Canadian Press. Archived from the original on 19 June 2011. Retrieved 16 June 2011. ^ "The Netherlands Forces - C7NLD, C8NLD, LOAWNLD Upgraded from C7, C7A1, C8, C8A1, LOAW". Retrieved 15 November 2014. ^ a b c Miller, David (2001). The Illustrated Directory of 20th Century Guns. Salamander Books Ltd. ISBN 1-84065-245-4. ^ "Kitchener plant to make new gun for front-line RCMP officers". Canadian Press. 21 October 2011. Retrieved 22 October 2011. ^ "Colt C7/C8NLD 5.56mm". Archived from the original on 4 November 2014. Retrieved 15 November 2014. ^ Bartocci, Christopher R. (2004). Black Rifle II The M16 into the 21st Century. Collector Grade Publications Incorporated. ISBN 0-88935-348-4. ^ "Paint-ball kan ha utløst politiaksjon - VG Nett". Vg.no. 2005-08-17. Retrieved 2013-08-31. ^ "Royal Military Police train for close protection". Retrieved 15 November 2014. ^ "SAS Weapons - C8 SFW Carbine L119A1s". Wikimedia Commons has media related to Colt Canada C7. Wikimedia Commons has media related to Colt Canada C8. This page was last edited on 2 April 2019, at 19:51 (UTC).